If you live in North Carolina, you have a wide variety of deer-resistant plants to choose from, ranging from trees to grasses. 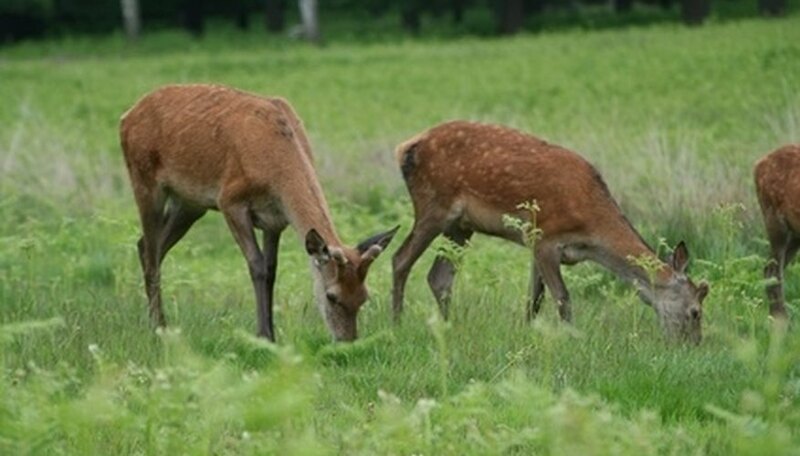 While no plants are truly deer-proof -- deer will eat anything available during times of stress and starvation -- choosing deer-resistant plants will increase the chances of getting your lawn and garden through the year unscathed. Deer damage trees in two ways: by eating leaves and by rubbing their antlers against the bark, which is particularly damaging to young trees. Place wire mesh cylinders around young trees to protect them from antler damage. North Carolina trees that are least likely to be damaged by deer include live oak, bald cypress, honey locust, American holly, southern magnolia and various pines. You can plant a variety of shrubs, both evergreen and deciduous, that are resistant to deer. Evergreen shrubs like century plant, wintergreen barberry, rosemary, southern yew and oleander are seldom eaten by deer. Deciduous shrubs -- those that shed their leaves in fall -- include Japanesa barberry, butterfly bush and blue mist shrub. Most ornamental grasses are long-lived and tough and are highly resistant to deer grazing. Indian grass, fountain grass and river oats are all well-suited to North Carolina, as are Korean feather reed grass, Pampas grass and maiden grass. Deer find flower buds and new growth particularly delicious in springtime. but certain perennials are more resistant to deer than others. Options include sleeping hibiscus, powis castle artemisia, false indigo and Texas sage, all of which are both native to the southeastern United States and seldom damaged by deer. While perennials come back on their own year after year, annuals have to be replanted every spring, which means deer grazing can be particularly devastating to these plants. Among the annuals seldom eaten by deer are begonias, snapdragons and petunias, along with zinnias, marigolds and ornamental peppers. In general, deer rarely graze ferns. Plant these leafy ground plants if you have moist soil and shade. Evergreen ferns for North Carolina include autumn fern, Christmas fern and Florida shield fern. Southern maidenhair, lady fern and royal fern are deciduous options.